I am a huge fan of cooked lettuce. It sounds a little funny, but hear me out. I grew up eating Chinese food and salad just does not exist in traditional Chinese cuisine – lettuce is always cooked. There are no raw vegetable dishes. I’m not sure if this is because most vegetable dishes have a little bit of meat in them or if it’s a remnant of the fact that there weren’t reliable sources of running water for vegetable washing. Regardless, raw wasn’t very common. Now of course, salads are super common place everywhere, but my favourite way of eating lettuce is still when it’s slightly cooked. 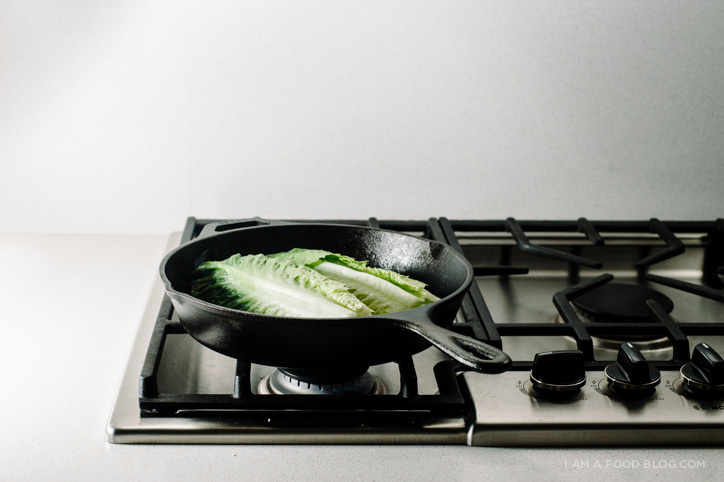 Something magical happens when you cook lettuce, especially when it just starts to wilt – the edges become silky smooth, the leaves become a little bit sweeter, the core a little bit crunchier and overall, it just gets a whole lot tastier. 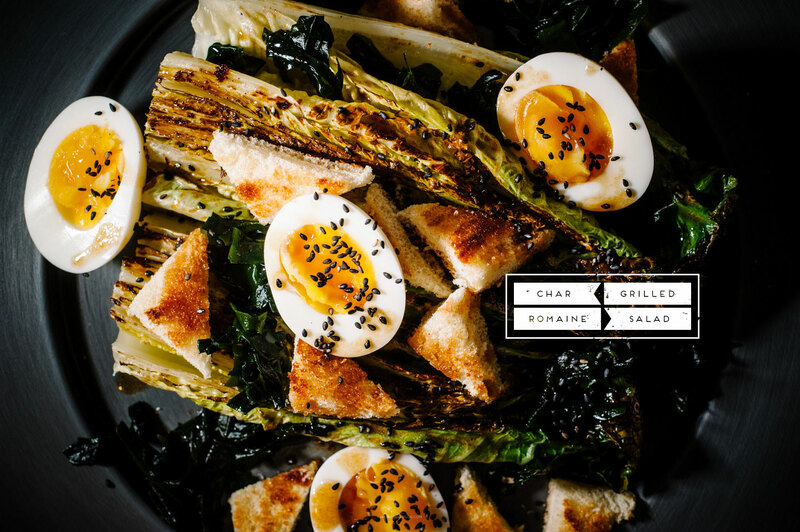 Grilled romaine seems to be a thing these days, but I’m going to be one of those annoying “hipster” types and say it: I was into cooked lettuce WAY before it became a thing. Anyway, now that it is a thing, I wouldn’t blame you for getting into it too, but you might want to learn more about it before you start cooking every bit of lettuce you see. Speaking of hipsters – if you’re on the lookout for the next ingredient that’s going to make a splash in the the food world, my bet is on Chinese black vinegar. It’s malty, slightly sweet, and just a little bit reminiscent of balsamic. More importantly, it’s super tasty. 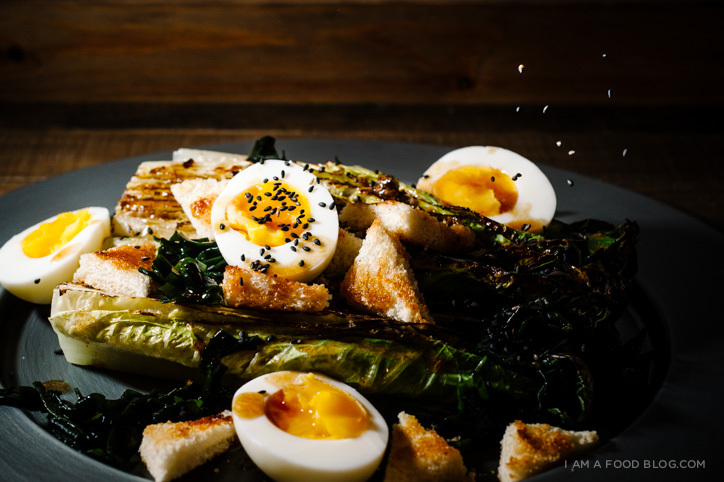 This salad has everything: charred lettuce with a bit of crunch, silky seaweed, creamy medium boiled eggs, toasty croutons and an addictive dressing. I could seriously eat it everyday! 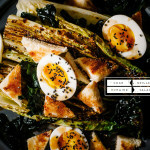 i am grilled, i am dressed: i am grilled romaine salad! Whisk together the dressing ingredients, taste and adjust soy and vinegar if needed; set aside. Rehydrate wakame in hot water according to directions on package. While the seaweed is rehydrating, grill your croutons. Heat a bit of oil in a non-stick skillet and grill bread on both sides until golden and crisp. Set aside. In a large frying pan, heat up a touch of oil over medium high heat. 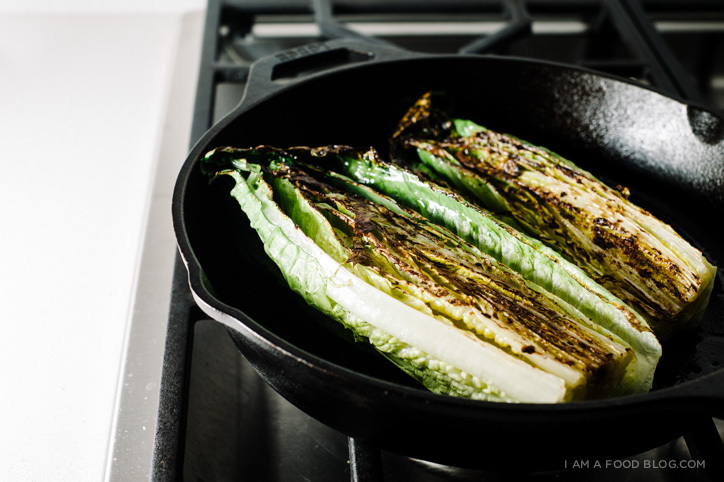 Place the romaine in the pan, cut side down and fry until slightly charred and wilted, flipping once. Remove from the heat when done. Drain the wakame and toss with a bit of the dressing. Cut the toasted bread into large croutons. 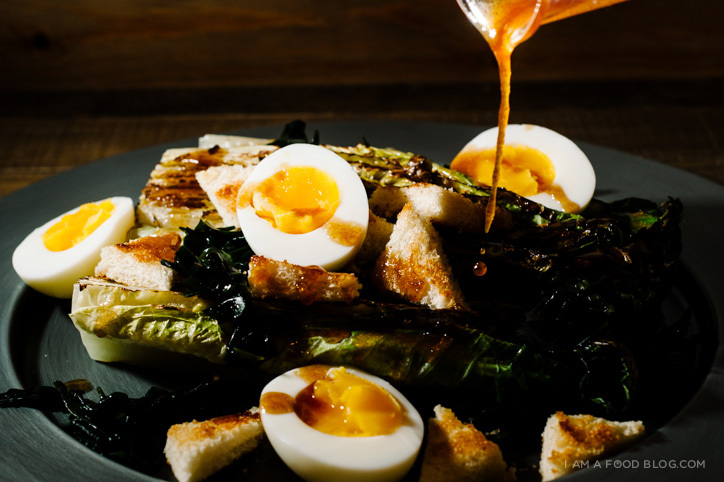 Assemble the salad by placing the grilled romaine on a large plate. Top with grilled croutons, dressed seaweed and egg halves. Drizzle on the dressing and sprinkle on a few black sesame seeds. Enjoy immediately. That is just not true. I’ll grant that raw food is not the most common, but to say it doesn’t exist is just plain wrong. Try Old Tiger Salad (老虎菜), a well-known dish from China’s north-eastern provinces. The salad consists of very thinly sliced (juilienned) green onion (spring onion), cucumber, daikon radish, carrot, perhaps some green pepper and certainly coriander leaf (cilantro). The slivers of vegetation are mixed together then served with a chilli dressing. Some versions include thinly sliced chillies in the salad, then dress with a garlicky soy, vinegar and sesame oil dressing . The strips of vegetable are supposed to resemble the stripes of the tiger. There is also a version from Xinjiang. Another raw vegetable dish is Sichuan’s Smacked Cucumber. This is raw cucumber marinated in a spicy dressing. Most supermarkets have a selection of raw salads. Just yesterday I went to lunch with a good friend here in Southern China, We were served two salad dishes, both of which contained raw lettuce. That said, I love simple stir fried lettuce with oyster sauce. whoops, i stand corrected! my parents aren’t from the north-eastern part of china so i think they haven’t had that dish! but..you’re absolutely right, i have had smashed cucumbers before! i also grew up eating chinese food and my parents always serve their vegetables cooked. they said it was because raw vegetables were harder to digest. so i had always thought salad didn’t exist in traditional chinese cooking, too. maybe raw salads are regional, or traditionally limited to certain economic classes? i would also guess that vegetables marinated in vinegar could negate the effects of indigestion. I have never cooked or grilled lectures but I have to try out this recipe next time I do a salad. I also love its simplicity as I don’t like salad which included 20 or more ingredients. this is a beeeeeeautiful thing! I need to get some black vinegar. I had a recipe that called for it the other day and just kind of had to make do without it. 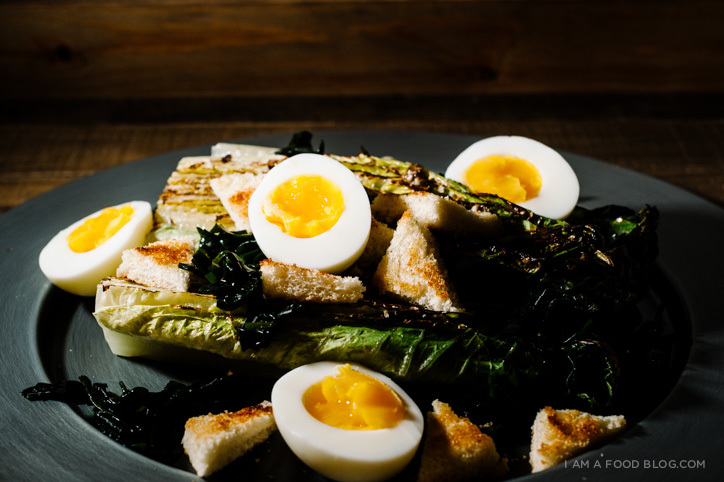 I also definitely need to make this salad since I had a head of romaine languishing in the fridge and I make these eggs once every few days as it is. ohmagawd i am not a salad person, but steph, you are seriously turning me into one. also re: your prediction about chinese black vinegar being the next big thing — TOTALLY. I’m still yet to try grilled salad but this looks so darn good! And that runny egg!!!!!! give it a go millie!! i’d love to see you do a grilled salad video! Oh my gosh, Steph! This looks delicious! And where in the world did you get that plate? It looks so chic! Never had grilled lettuce before, didn’t even know it could be grilled! I do love the addition of seaweed to it. But. HOW has no one commented on the last shot yet? That freeze frame of black sesame seeds being tossed, suspended in motion and just almost hitting that salad = beauty. I LOVE that shot. I love discovering Asian ingredients as a lot of them once you get the past any weird ingredients are sooo flavorful. Fish sauce, oyster sauce, fermented black bean paste…. will have to look out for Chinese black vinegar. yup, us asians got some weird tasting stuff out there. but…it’s also fantastic tasting too! Whoa girl this salad is a BEAUT. I can totally see why you’d say you could eat it everyday! Get me some wakame and Chinese black vinegar (you are so fooducated) stat!! I am so with you on the cooked lettuce thing–I looooove cooked lettuce (and cabbage–my mom used to make pot roast with tons of cabbage and I’d just eat the cabbage. So good.). Plus those EGGS?!?! You make salad look positively sexay!! ugh, i could eat bowls and bowls of just wakame. is that weird!??! Totally badass. Love this salad! you gotta get your hands on some wakame!! i think you’ll love it :) it doesn’t have much flavour on its own, but i LOVE the texture. I am intrigued by the fact that you cooked the lettuce…I’ve only ever eaten the boring raw way! Need to try this ASAP! oh, but raw isn’t BORING!! i LOVE raw lettuce too!! oh myyyy this looks delightful! i’ve never tried grilled lettuce and now seriously have to get on it! ooh, hope you get a chance to try it jessica! Eeeeee! This recipe screams my name! I wanted to try grilled lettuce for the longest time. Now there’s plenty of it growing in my garden, I have no excuse. And, surprisingly, I have Chinese black vinegar too! I actually got it because I mistook it for something else (there is a Chinese grocery close to where I work, everything is written in Chinese and the owners only speak Chinese x_x”) and I couldn’t figure out what to do whit it. It is the most umami-rich thing I have ever tried on this planet. Then a lady I know made a veggie stir-fry using only that, olive oil and white pepper, and I LOVED IT. It is a yet-to-be-discovered ingredient. You’re so right – it’s gonna go wild at some point. woot!! garden grown lettuce!! i’m jealous. i have a black thumb. and plus i don’t have a garden :( eat lots n lots of home grown goodies this summer for me!!! Yes, I’m always trying to explain to my friends how I love veggies but have a huge dislike for salads because I just didn’t eat them growing up in a Chinese household. In college, I used to pour soup over my salads to wilt the lettuce a little because salads were the only veggie options. It confuzzled my friends. hahahah i don’t think ever was THAT extreme. but yeah, chinese peeps are weird with their food things, trust me, i know!! 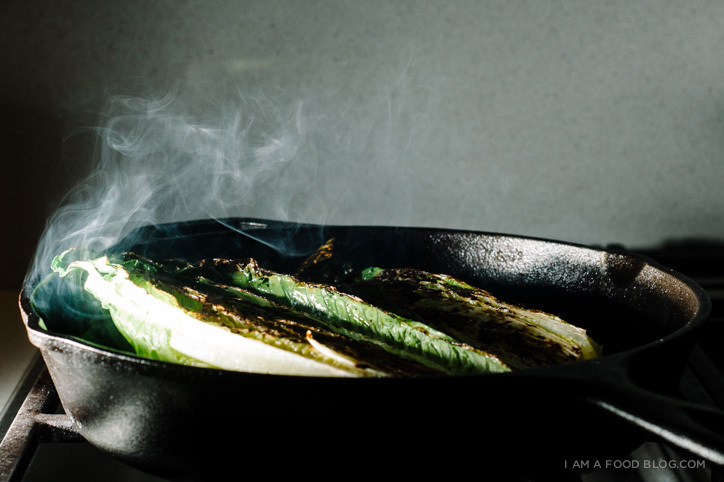 I’ve always been a little weary of the idea of grilled lettuce, but lately I’ve been grilling everything and I think it is about time I give grilled romaine a try! I bet it tastes delicious with that dressing and those eggs! yeah, grilled lettuce sounds weird, but give it a go…your life might be changed!! Can you do this recipe without the seaweed? If not, are there any easy replacements? You can totally skip out on the seaweed. It adds a delicious texture, but if you’re not fond of it, it isn’t essential. Hope that helps! I want to say that this is an awesome example of ingenuity!! I am a food snob and this is just beautiful to me!! Wow thank you for the inspiration! !